The actor Oskar Sima attended the conservatory for acting and took acting lessons by Karl Etlinger. He made his theater debut at the Volksbühne Vienna but after few roles his career was interrupted by World War I. He was able to continue his career in 1919 and he appeared in Vienna, Prague and Berlin in the following years. 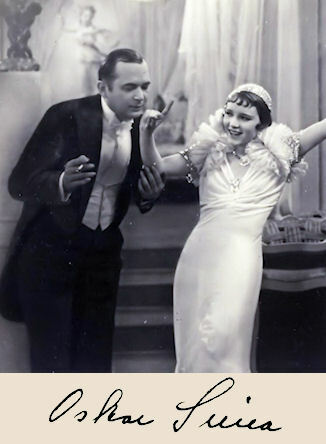 He already made his film debut in 1921 with "Die Ehe der Hedda Olsen oder Die brennende Akrobatin" (21). It followed other silent movies like "Verklungene Zeiten" (22), "Haifische der Nachkriegszeit" (26) and "Sensations-Prozess" (29). But his great film career went hand in hand with the talkies. Especially in the 30's he could impersonate different characters, and especially his crafty and vicious roles stand out very much. To his well-known movies of the 30's belong "Der unsterbliche Lump" (30), "Liebling der Götter" (30), "Einbrecher" (30), "Die Gräfin von Monte Christo" (32), "So ein Flegel" (34), "Heinz im Mond" (34), "Liebe, Tod und Teufel" (34), "Glückskinder" (36), "Gasparone" (37), "Fünf Millionen suchen einen Erben" (38) and "Frau im Strom" (39). His dubious figures were brought into action many times in the next years. Till the end of war the impressive actor took part in "Trenck, der Pandur" (40), "Sieben Jahre Pech" (40), "Kohlhiesels Töchter" (43), Der weisse Traum" (43) and "Orientexpress" (44). After the war there was a huge demand for entertainmant movies and Sima took part in nearly all of them. There was hardly a movie in which Oskar Sima didn't act. To his numerous post-war movies belong "Die verschleierte Maja" (51), "Grün ist die Heide" (51), "Mikosch rückt ein" (52), "Die Rose von Stambul" (53), "Die Drei von der Tankstelle" (55), "Familie Schimek" (57), "Hallo, Taxi" (58), "Die Abenteuer des Grafen Bobby" (61) and "Leinen aus Irland" (67). Only a heart attack stopped his career in 1968 and he retired from the film business. The likeable "meanie" died one year later in Hohenau. Oskar Sima was married with the actress Lina Woiwode.